November 18, 2012  The world's most-watched motorsport series races in America for the first time in five years at a new track in Texas. In an exciting race, Lewis Hamilton passes championship leader Sebastian Vettel to win. 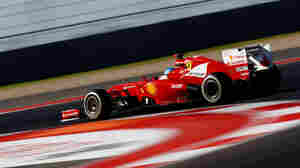 Ferrari's championship contender Fernando Alsonso finishes third, sending the title fight to the final race in Brazil.